of Qatar, to Political Resident A senior ranking political representative (equivalent to a Consul General) from the diplomatic corps of the Government of India or one of its subordinate provincial governments, in charge of a Political Residency. in the Persian Gulf Historically used by the British to refer to the sea area between the Arabian Peninsula and Iran. Often referred to as The Gulf or the Arabian Gulf. .
ment the various arrangements which they have made. 4 (c)— From India Office The department of the British Government to which the Government of India reported between 1858 and 1947. The successor to the Court of Directors. to Anglo-Persian Oil Company. Concession granted to the Company by the Sheikh of Qatar. 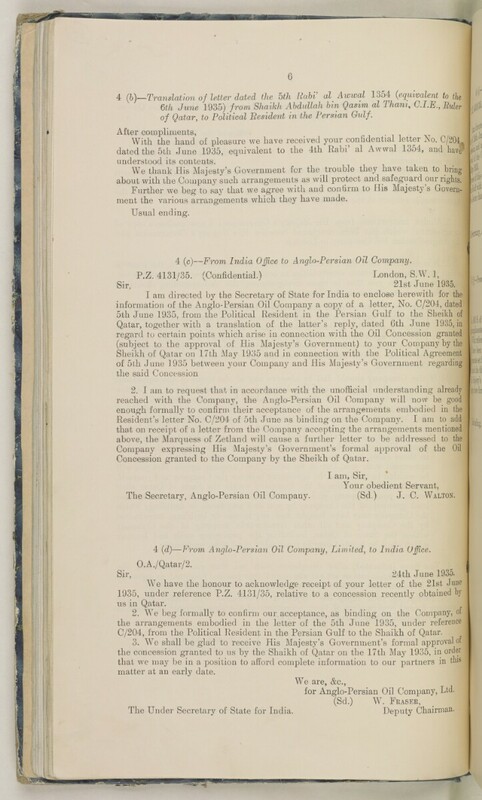 4 (d)—From Anglo-Persian Oil Company, Limited, to India Office The department of the British Government to which the Government of India reported between 1858 and 1947. The successor to the Court of Directors. .
C/204, from the Political Resident A senior ranking political representative (equivalent to a Consul General) from the diplomatic corps of the Government of India or one of its subordinate provincial governments, in charge of a Political Residency. in the Persian Gulf Historically used by the British to refer to the sea area between the Arabian Peninsula and Iran. Often referred to as The Gulf or the Arabian Gulf. to the Shaikh of Qatar. matter at an early date. for Anglo-Persian Oil Company, Ltd. The Under Secretary of State for India. Deputy Chairman.